At its 33rd Annual Awards Banquet on January 20, the New Hampshire Chapter of the American Institute of Architects (AIANH) named John W. Hession an Honorary Member of the Chapter. This award is bestowed on non-architects who have given distinguished service to the profession of architecture or to the arts and sciences related to architecture within the state of New Hampshire. Mr. Hession has been a member of the Chapter’s Environmental Guild since 2004, providing insights and working on initiatives to promote the Guild’s mission of advocating for a more productive and healthy built environment through sustainable design principles. He was involved in five of the six Integrated Design/Integrated development conferences the Guild sponsored and has been a fearless and tireless proponent of the 2030 Challenge, a goal set forth by the architecture community to reduce and ultimately eliminate fossil-fuel-emitting energy to operate buildings by the year 2030. Over the years, Hession has provided gratis services to AIA New Hampshire, documenting countless events. He is currently filming and directing a documentary, “Net-Zero in New England,” a project of the NH Architecture Foundation. Two segments of the film were previewed last September at the Red River Theatre in Concord. He has also produced video recordings and interviews of the 2015 and 2016 New England COTE (AIA Committee on the Environment) Summits in Portland, ME, and Boston, MA. Hession’s architectural photography is well-recognized throughout the state. Much of it can be seen in the pages of NH Home Magazine, where he is the photo editor. He and his wife, Valerie Michaud, also co-authored Wildflowers of the White Mountains, a pocket field guide to New Hampshire’s wild flowers. Hession got hooked on filming and photography after working as a lawyer for three years. (He earned a JD from Boston University in 1983.) That led him to New York where he started a production company that created new magazine shows, commercials, documentary, and dramatic films for a variety of clients. He opened his photo studio in New Hampshire in 1999 and began specializing in architectural photography in 2001. 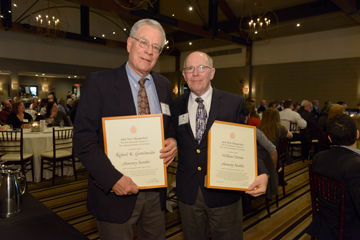 At its 32nd Annual Awards Banquet on January 22, the New Hampshire Chapter of the American Institute of Architects (AIANH) named Richard K. Gsottschneider and William Norton as Honorary Members of the Chapter. This award is bestowed on non-architects who have given distinguished service to the profession of architecture or to the arts and sciences related to architecture within the state of New Hampshire. Mr. Gsottschneider was recognized as the driving force behind RKG Associates, a planning, economic consulting, and real estate advisory firm founded in 1980 in Durham, NH. Led by Gsottschneider’s emphasis on job creation and expansion of the local tax base, RKG’s efforts are grounded in economics supporting urban development, neighborhood revitalization, city and state housing strategies, urban corridor revitalization, adaptive reuse and military base redevelopment, as well as residential, resort, office/industrial, retail/mixed use development, and campus planning. Gottschneider has been personally responsible for 50 or more highly successful projects in New Hampshire alone, and many more nationally and internationally over the past 35 years. Of all his projects, he is perhaps most proud of the redevelopment planning for the former Pease Air Force Base in Portsmouth. Lasting almost six years, the work included the initial marketing strategy, land use plan, and financing plan, as well as the acquisition strategy from the Air Force. The project to date has created over 10,000 new jobs and has helped transform the economy in the Seacoast Region. The success of the project led to RKG’s working on over 60 military base reuse projects throughout the United States. Other adaptive reuse projects have happened in Newmarket, Jaffrey, Portsmouth, Keene, Manchester, Exeter, Nashua, Concord, and Laconia, and other communities throughout the country. Mr. Norton was recognized for his outstanding work and dedication to creating a healthy built environment in New Hampshire and promoting the importance of quality design. For over 35 years, as president and principal of Norton Asset Management, Inc. in Manchester, he has offered counsel on everything from contract negotiations to real estate and building options. As a specialist in the management of the construction process from design through occupancy, with extensive experience in energy and facility management and a deep interest in architecture, he is an invaluable asset to the community. Norton has served on numerous non-profit and zoning boards. In fact, twenty percent of his time goes to non-profits, guiding them through the morass of figuring out their real estate and building options and architect and contractor selections. He was a charter member and past president of Plan NH and helped to launch their pro bono charrette program, participating in over 15 of them. He also helped found the 20/20 Vision for Concord initiative, served on its board for 10 years, and started the Greater Manchester Infrastructure Forum. He has written monthly articles for twenty years in the New Hampshire Business Review and the New England Real Estate Journal, focusing on commercial real estate and the New England economy. At its 30th Annual Awards Banquet on January 10, 2014 the New Hampshire Chapter of the American Institute of Architects (AIANH) named Jennifer Goodman and Phyllis Stibler ASIDHonorary Members of the Chapter. This award is bestowed on non-architects who have given distinguished service to the profession of architecture or to the arts and sciences related to architecture within the state of New Hampshire. Ms. Goodman is the Excecutive Director of the New Hampshire Preservation Alliance and Ms. Stibler is president of Stibler Associates. Jennifer Goodman was recognized for her outstanding work and dedication to the architectural and preservation communities in New Hampshire and for her expertise in preserving New Hampshire's historical legacy as Executive Director of the NH Preservation Alliance. Specific accomplishments include her leadership and efforts to save and revive the Daniel Webster Farm in Hillsboro; the team effort that received the National Honor Award for the Acworth Meetinghouse Restoration in 2011; and leading the collaborative efforts to develop a preservation easement and the Old House and Barn Expo. Through her leadership of the Preservation Alliance since 1998, she has improved preservation assistance for community preservation leaders and homeowners, increased its membership over 200%, and its annual operating budget from about $70,000 to nearly half a million dollars. She has helped organize support for important Legislative actions, including the Land and Community Heritage Investment Program (LCHIP) and an expanded downtown preservation tax incentive. Jennifer has also presented and published widely on community-based preservation planning and advocacy techniques that require negotiation and collaboration. She established the Green Guidelines for state and local policy-makers and co-edited Restoring Women’s History through Historic Preservation, which won the Society of Architectural Historians’ preservation award in 2004. Phyllis Stibler ASID is president of the largest, longest-lived, and most successful Interior Design practice in New Hampshire. She has exhibited extraordinary design talent over her 30+ year career, working on complex renovations and large-scale new construction for all project types, not only here in New Hampshire but across the country and abroad. She has received multiple awards for her work, for such projects as the UNH campus in Manchester, the Foundation for Seacoast Health Community Campus in Portsmouth, PC Connection, the Manchester Airport Terminal, Nynex/City Hall Plaza, as IDEXX Laboratories in Westbrook, ME, and the New Hampshire Charitable Foundation. Stibler was a founding director and past-president of Plan NH and served on the AIANH Board of Directors for two three-year terms. Throughout her career, Phyllis has given extraordinary service to the community at large, volunteering in various capacities in support of the arts and of service organizations such as the NH Institute of Art, NH Business Committee for the Arts, the Arts Builds Community, the Manchester YMCA, the Girl Scouts Swiftwater Council, the NH Charitable Foundation, the NH Aviation Historical Society, and the Chamber of Commerce Foundation. In 2006 she received an Outstanding Service Award from AIANH and the Leadership New Hampshire’s Cotton Mather Cleveland Award. The Greater Manchester YMCA presented her with Community Service Awards for facilities work in 2000, 2006, and 2007, and named her volunteer of the year in 1996. Stibler Associates was named New Hampshire Business of the Year in 1994. Stibler’s dedication to good design and her volunteer efforts to the community, all delivered with enthusiasm and charm, have made her one of the leaders of New Hampshire’s design and construction industry. At its 29th Annual Awards Banquet on January 11, the New Hampshire Chapter of the American Institute of Architects (AIANH) named Louise Lavertu and Jay Kahn PhD Honorary Members of the Chapter. This award is bestowed on non-architects who have given distinguished service to the profession of architecture or to the arts and sciences related to architecture within the state of New Hampshire. Ms. Lavertu is the Excecutive Director of the New Hampshire Joint Board of Licensure and Certification. Dr. Kahn is the Interim President at Keene State College. Ms. Lavertu was recognized for her outstanding work and dedication to the architectural community in New Hampshire and for her expertise in licensing, the legislative process, and as a guide for the board of architects. Louise has served as the Executive Director the New Hampshire Joint Board of Licensure and Certification for 17 years. She oversees the regulating of approximately 31,500 licensed or certified individuals and businesses. During her tenure she has been instrumental in implementing legislative agendas and has protected legislative rights for the profession when they have been in jeopardy. She is a source of knowledge for many professionals across the state who are in pursuit of licensure and has created an open and friendly office staffed with well-trained people. Dr. Ka hn, Interim President at Keene State College, served as Vice President of Finance and Planning since 1988. He has overseen a dramatic physical transformation of the campus that includes some of the state’s most architecturally significant academic buildings of the past 25 years. In terms of campus planning and architecture, Kahn was the driving force behind a master planning exercise in the early 1990s, and for the string of noteworthy building projects that resulted from it, including the Pondside Residence Halls, Zorn Dining Commons, Young Student Center, Mason Library, Putnam Science Center, Rhodes Hall, the Alumni Center, and the new TDS Center. Several of these have won design awards from AIANH. Because of Kahn’s vision and leadership, KSC is now consistently recognized by The Princeton Review as one of the top colleges in the Northeast (comparing favorably with many private institutions) for both academic programs and campus appeal, and one of the greenest schools in the country. Beyond his work on KSC’s campus, Kahn has been actively involved with a wide range of academic, civic, and charitable organizations, many with connections to or implications for the design and construction industry. For a list of all Honorary AIANH Members, go to the member roster and search by “Honorary AIANH Members”. AIANH named Linda Ray Wilson as an Honorary Member of the Chapter at the 2012 Annual Awards Banquet. This award is bestowed on non-architects who have given distinguished service to the profession of architecture or to the arts and sciences related to architecture within the state of New Hampshire. Wilson was recognized for her outstanding work and dedication in steadfastly preserving, protecting, and honoring the built environment of New Hampshire. Linda has revealed that as a child she wanted to be an architect, but instead of enrolling in a graduate program in architecture after college she took a job with Arthur Eldredge’s architectural office in Peterborough. Rick Monahon AIA, then a fellow employee, recalls that Linda’s “capacity for organizing and hand drawing a well-detailed set of construction documents was truly impressive.” Her real passion though, was for preservation. She became involved in trying to save the Spaulding-Gatto house in Peterborough, an effort that failed, but that set her on her path to save many more of New Hampshire’s treasured historical resources. Linda began working with the State Department of Historical Resources in July 1975, ultimately becoming its Director and State Historic Preservation Officer until May 2011, when she retired.